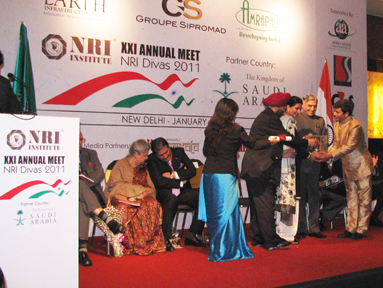 Manick Sorcar received the Bharat Samman (India Honor): Achievers Award 2010, at the XXI Annual Meet NRI Divas 2011 of the NRI Institute, held at Hotel the LaLit, New Delhi from the hands of Sri Pawan Kumar Bansal, the Honorable Union Minister of Parliamentary Affairs, in the presence of Maharani Preneet Kaur, the Honorable Union Minister of State for External Affairs. 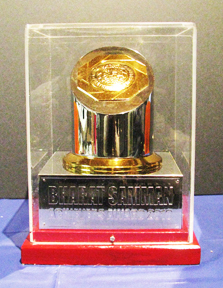 Manick was one of the three persons from the USA and 34 from the world to receive the prestigious award this year. He was introduced as a Renaissance Man and was bestowed with the award for outstanding achievement simultaneously in science (lighting design and author of university texts) and arts (pioneering award-winning Indian animation to the West and laser-artist). Foreign Affairs. 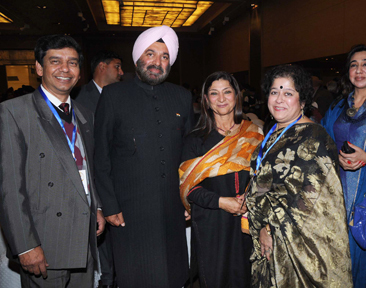 On left is Jagmohan Singh, Secretary General of the NRI Institute. 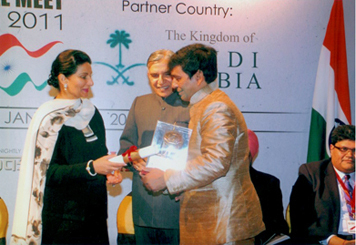 Maharani Preneet Kaur congratulates Manick after handing the honorary plaque at Hotel LaLit, New Delhi. All together it was a three day event. 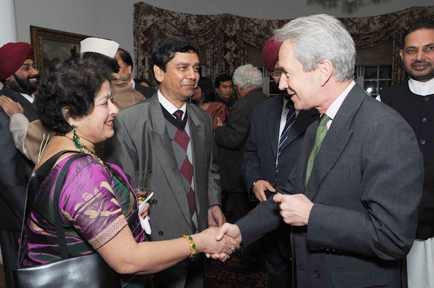 On January 7, 2011 the delegates were given a formal reception by Sir Richard Stagg, the Honorable British High Commissioner to India and Lady Stagg, at their residence at 2, Rajaji Marg, New Delhi. 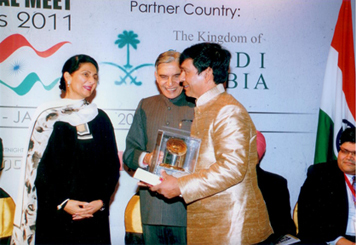 The second event took place on January 9, 2011 starting with a cultural program at FICCI Auditorium followed by Annual Dinner at the Le Meridien hotel. Chief Guest of the event was Smt. 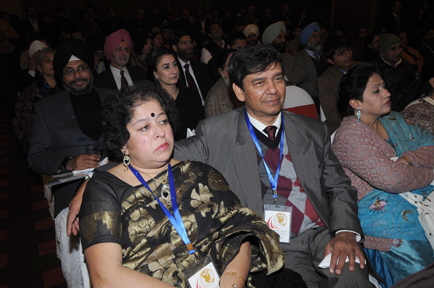 Ambika Soni, Union Minister for Information and Broadcasting, and Guests of Honor were His Excellency General J.J. Singh, the Governor of Arunachal Pradesh, and The Rt. Hon. Baroness (Dr.) Verma, Minister of U.K. Government. 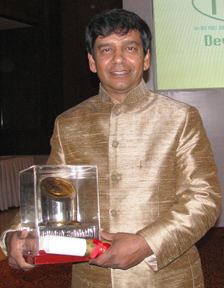 The Award Ceremony took place on January 10, 2011, 8 pm, at a gala dinner at Hotel the LaLit, New Delhi. 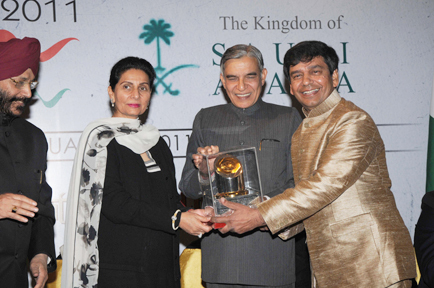 The Chief Guests were Maharani Preneet Kaur, Union Minister of State for External Affairs and Sri Pawan Kumar Bansal, Union Minister of Parliamentary Affair. Other guests included Olympic-famed Padma Shri Milkha Singh, Rtd. Air Chief Marshal Padma Vibhushan Arjan Singh, several members of the Parliament, ministers from New Zealand, Ambassador of Saudi Arabia, etc., who graced the event with their presence and speeches. Commissioner to India, at his residence during the reception . 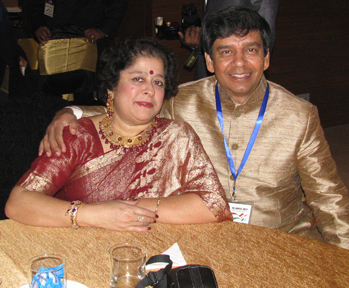 The NRI Institute, a Non-Profit NGO registered body of People of Indian Origin was founded in the Year 1989, aiming to provide a platform for the Indians living in India and abroad. It promotes NRI investments in India and paves the way in this regard with an effective approach towards the Government and other authorities. The Institute highlights the achievements of NRIs and PIOs in their chosen field of activities. 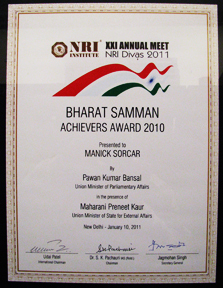 Manick Sorcar is humbled to join an illustrious list of past awardees that include Sam Pitroda, chairman of India's National Knowledge Commission; Lord Swaraj Paul, British parliamentarian and founder of Caparo Group; Baron Karan Bilimoria, CEO of Cobra Beer; His Excellency Sir Anerood Jugnauth, President of Mauritius; Her Excellency Nimisha J. Madhwani High Commissioner of Uganda to India; and Baroness Sandeep Verma of United Kingdom.